Home / Food / McDonalds Meal Deals / McDonalds Meal Deals: Happy Bundle! McDonalds Meal Deals: Happy Bundle! The newest of McDonalds meal deals is the Happy Bundle. With this treat, family, relatives, friends, and colleagues at work and everywhere else will surely create great bonding moments! This bundle consists of 4 burgers, 4 medium sized fries, and 4 regular Coca-Cola drinks. Burger options include Big Mac, Quarter Pounder with Cheese, Double Cheeseburger, McChicken, or Filet-o-Fish and 4 Coca-Cola drinks choices are Sprite or Coke in regular, light, or zero. You save Php 221 when compared with a la carte prices. This McDonalds meal deals bundle on the other hand consist 4 chicken pieces or 20 McNuggets, 4 McSpaghetti, 2 large fries, and Coca-Cola drinks choices. Drinks can be either Sprite or Coke in regular, light, or zero. You save Php 203 as compared to a la carte prices. 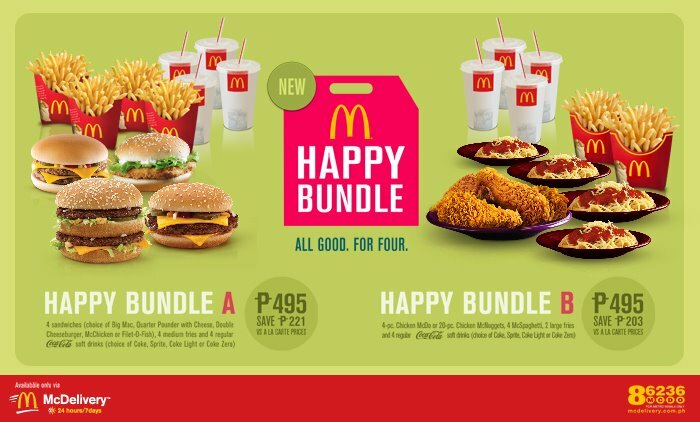 The Happy Bundle is only available via McDonald’s delivery at 86236 or 8McDo from 10:30 AM to 4 AM only or online via www.mcdelivery.com.ph. Prices does not include the possible Php 40 delivery charge yet. Go ahead and enjoy a bonding moment through this McDonalds meal deals today!